This shirt?! I die. Seriously, how stinkin' cute can you get? 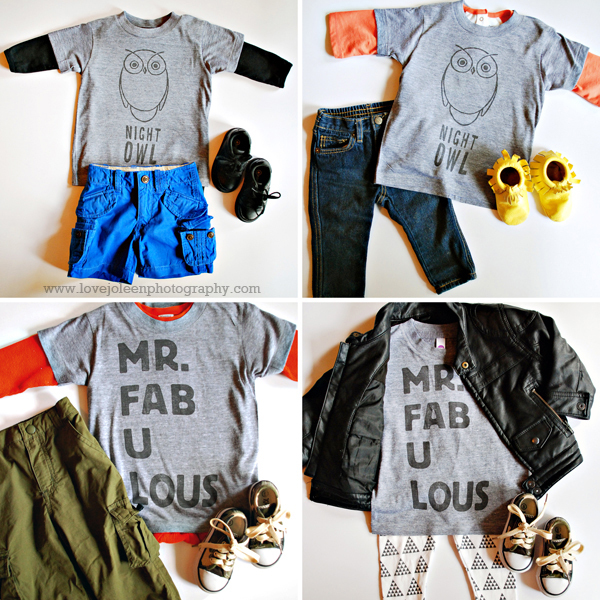 When I saw this Mr. Fab U Lous tee among all the adorable designs from Sugarboo & Co. I knew it would immediately be added to my Favorites. They do carry Baby tees but since Benjamin has been wearing 12-18 months for a while now, I've been getting him 18-24 mo. for Fall + Winter. These cute Sugarboo Designs prints are printed onto American Apparel's Tri-Blend (50% Polyester / 25% Cotton / 25% Rayon) tees so they're really soft. They come in children's sizes 2 - 12. Also part of my Favorites Giveaway is this Night Owl tee. Love! Last week we had a couple of cool Fall-like days that had me longing for Autumn. It is by far my favorite season here in Georgia and I can't wait to dress my family in layers. 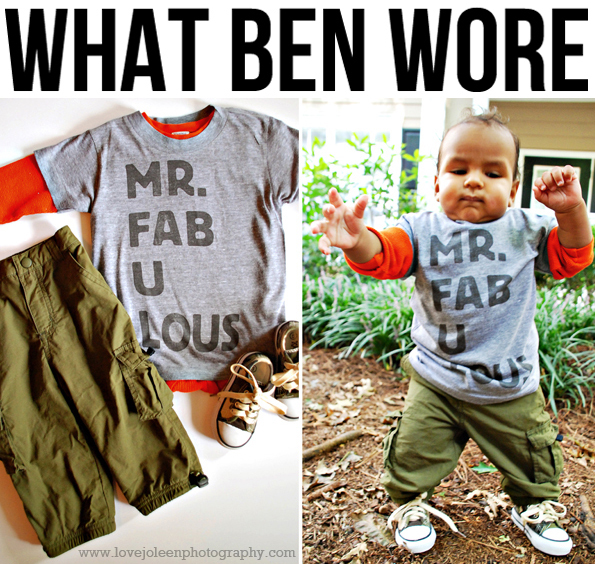 I put together these four Fall looks for Benjamin that I am loving! I almost always include some pop of color (a trick I learned from my mom) but how great is that outfit on the bottom left with the House of Mia leggings? I can't wait for Benjamin to grow into that jacket I found on consignment a few weeks ago! As you can see the outfit above was a little bit big on him but I think he'll grow into it nicely over the next few months. Also, he's standing (!!) more and more [unassisted] each day! It's such an exciting time around here and I can't wait to write his 9 month letter next week. 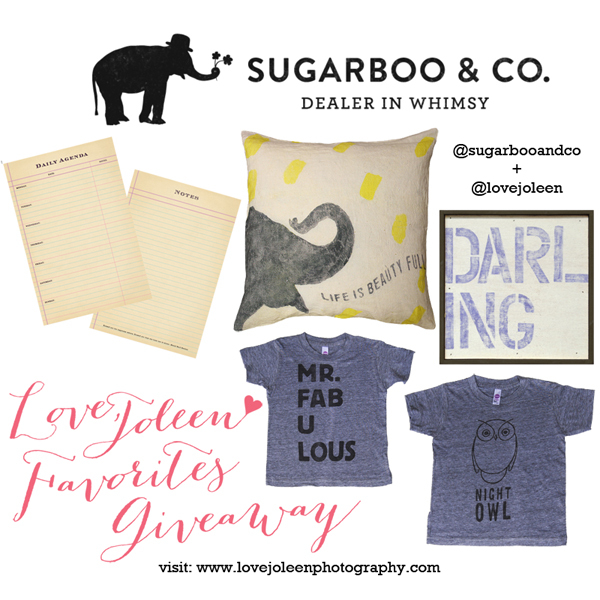 Today is the last day to enter to win my Favorites Giveaway from Sugarboo & Co.! Are you following them on Twitter? Facebook? Instagram? Have you shared this giveaway? Pinned it? There is still time to do all these things and more for a chance to WIN this AWESOME prize!! Best of luck! *Non-disclosure: We received these tees complimentary from Sugarboo & Co./Sugarboo Designs in order to review.